I know I should have written this long ago but the events this morning compelled me to write something about my American Idol. He is probably one of the most controversial AI candidate this season or ever and also the most villified, but the first time I saw him during his audition in Cleveland, Ohio, I knew I am already a fan. His name is Scott Savol. He has the body of Winnie-the-Pooh and the voice of an angel. During the auditions, he told the world that his father once told him that he will not accomplish anything. 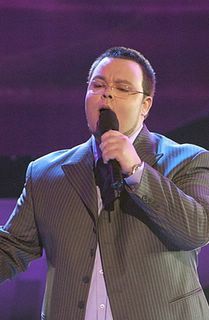 In the Hollywood rounds, he appeared to refuse to participate with his group song. And during the heat of the finals, an article came out on his past run in with the law. Yet I remained firm to be his number one Pinoy fan. Hey, I didn't care spending thousands of pesos on telephone calls just to call relatives and friends in the US to vote for him. If I were there, I would have spent entire two hours every week voting for this guy. He amazed the world with his rendition of beautiful ballads like "You are My Lady", "Against all Odds" among others. He also made us dance with such bouncy tunes as "Everlasting Love", "Ain't too Proud to Beg" and "I Can't Help Myself". Every week he surprised even his most ardent detractors by hanging on and staying in the competition. His staying power even prompted Simon to say that he has more escapes than Harry Houdini had. But this morning, I got the bad news that he has been voted out of the competition. End of the the American Idol dream for my idol. Funny, even though I haven't met the guy, I still felt sad for his departure from the show. I am not even an American for that matter!!! So this is a kind of tribute to the man who sort of represented the average man in that competition. Here's hoping that this wouldn't be the last that I will hear about this great guy, Scott Savol.